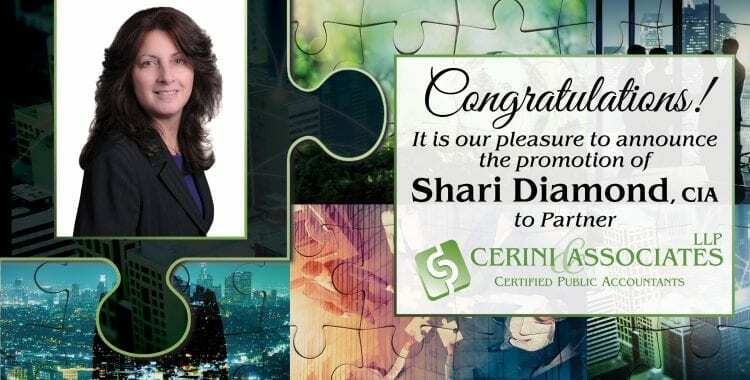 January 25, 2019 – Bohemia, NY – Cerini & Associates, LLP, a leading audit, tax, and business advisory Firm serving the tri-state area, further expands its growth with the promotion of Shari Diamond, CIA to Partner from Director, Internal Audit. Diamond joined the Firm in 2008 and has over twenty years of internal, claims, and IT-related audit experience. She will head C&A’s Internal Audit department. “Shari is well known in the Long Island School District arena. She has a deep understanding of systems, controls, IT, and compliance matters, making her a valuable resource to any organization that could benefit from internal audit, compliance audit, or general systems overviews. 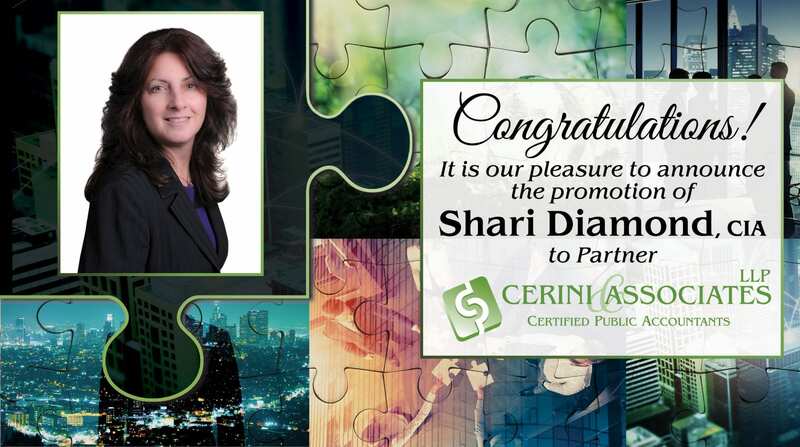 I couldn’t think of a better person to be part of Cerini’s Partnership Team,” said Ken Cerini, CPA the Firm’s Managing Partner. Also promoted was Tania Quigley, CPA, Carissa Scanlon, CPA, and Edward McWilliams, CPA to Director, from Manager. Quigley joined the Firm in 2005 and focuses on serving the firms nonprofit and employee benefit plan clientele in an audit and consulting capacity. Scanlon joined the Firm in 2007 with a high concentration on providing tax and review services to small and mid-size businesses. McWilliams joined the Firm in 2013 and provides tax and consulting services to mid-sized and large corporations with both domestic and international matters. “I am proud of our ability to attract and retain leaders in the accounting field. Tania, Carissa, and Ed are highly effective team members that go way beyond the fiscal and tax issues that our clients grapple with. They deliver meaningful, forward-thinking, and innovative solutions to our clients on a daily basis. All three of them possess the exemplary attributes that will shape the Firm’s future Partner Team,” said Kimberly Roffi, CPA, Partner. Jacob Lutz, CPA and Jeffrey Scott, CPA have been promoted to Supervisor. Kayla Vigorito has been promoted to Senior. Kaitlin Asam, CPA and Adam Brigandi, CPA have been promoted to Staff III. John Carpeneto, Brian Warfield, and James Laino, CPA have been promoted to Staff II. C&A is also excited to welcome four additions to the firm to meet the demands of a rapidly expanding list of clients. Toni Schuierer joined the Firm as a Staff II Accountant, Crystal Harvey as an Audit Senior, Alyssa Ocello and Lenny Giambalvo both have joined the Firm as Claims Auditors. We applaud these Cerini team members for their outstanding achievements. Cerini & Associates, LLP is a full-service accounting firm celebrating twenty-five years of excellence in leading-edge accounting and auditing services. With nearly fifty employees, five partners, and a foundation built on value-added ideas and integrity, C&A serves many industries, including healthcare, nonprofit, special education, school districts, technology, contractors, and an array of mid-sized businesses (including retailers, manufacturers, distributors, et al.). C&A’s services include, but are not limited to: accounting and auditing; tax compliance and business advisory; tax controversy defense and support; litigation support; mergers and acquisitions; internal audit; and operational and internal control reviews. C&A’s staff takes pride in the quality of its work and operates with the technical ability of a much larger firm. C&A is also proud to have received an unqualified opinion during its last tri-annual peer review. The firm is affiliated with many professional organizations, including the: New York State Society of Certified Public Accountants, American Institute of Certified Public Accountants, and Association of Certified Fraud Examiners.